Just the Place for You! 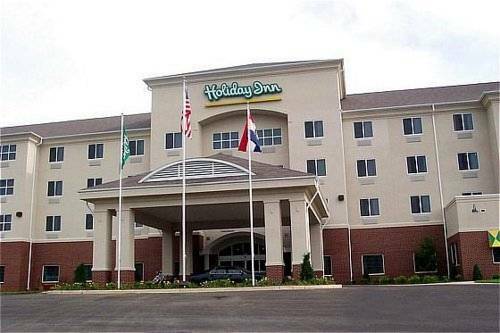 Progressive and contemporary, the Holiday Inn Poplar Bluff, MO hotel's priority is providing travelers with amenities that alleviate stress and increase productivity. Enjoy the newly renovated guestrooms that feature a beautiful color scheme and comfortable design. Those in Poplar Bluff on business know that free Internet access and a 24-hour Business Center ensure efficient communication, even while away from the office. Since Poplar Bluff Regional Medical Center is across the street and Poplar Bluff Industrial Park, home to businesses like Briggs & Stratton, Nordyne and Gates Corporation, is minutes away, business guests can spend more time at work and less time commuting. Four diverse event facilities make on-site meetings convenient and effortless. Leisure travelers enjoy being close to outdoor areas like Lake Wappapello, Current River and Mark Twain National Forest. With go-karts, mini golf and more, Hydro Adventures Water Park & Family Fun Center is also a terrific source for family fun. Another hit is The Historical Museum, which chronicles the rich heritage of Poplar Bluff, MO. The hotel's amenities offer patrons quality on-site recreation, too. Relaxation comes naturally in the indoor pool and the Fitness Center ensures an active trip. Castello's restaurant also promises to impress. Book today, and discover what makes this an award-winning hotel! Fine and Family Italian Dining. Serving a variety of steaks, burgers, and sandwiches. Tony's is located in our Castello's at the Inn Restaurant. Great sports bar with multiple TVs. Poplar Room includes an board room table with executive style chairs. ~58 miles from Poplar Bluff.